Heat the oven to 200-220C (have it quite hot). Blend all the ingredients together except the lamb and panko crumbs. Then lastly stir in the crumbs. Place the lamb on a baking dish and smooth some herb sauce on the underside of each. Heap some of the sauce on the top side of each cutlet. In other words, be generous with the herb sauce. 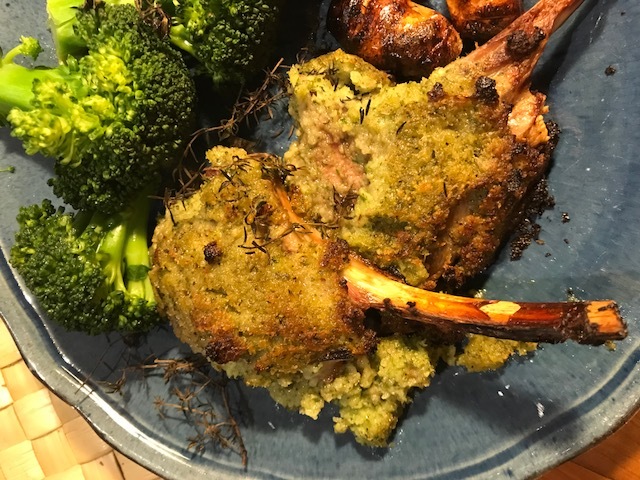 Put the lamb into the oven and cook for about 15 minutes depending on the thickness of the cutlets and if you like your lamb to be medium cooked. Take them out when done to your liking and let them sit for about 5 minutes before service.. Both sauces had a lovely taste and we’ll make them again to go with lots of other meals. Both would also work well tossed through pasta. Perhaps just leave out the panko crumbs if you mix it with pasta.